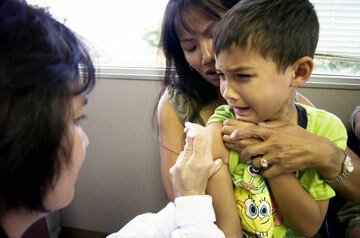 Dr. Elizabeth Abinsay examines Mark Manuel, 14, at her office in Kalihi. "We value discipline. If not, we wouldn't be here today," she said of her father's strong work ethic. Abinsay moved to Hawaii from the Philippines in 1981. SIX-YEAR-OLD Jonathan Brabazon sat on his mother's lap and pulled his right sleeve toward his shoulder as Dr. Elizabeth Abinsay approached him with a needle for his hepatitis B shot. Community Kalihi is home to a community of small businesses that cater to Filipino immigrants. Citizenship After four decades in Hawaii, the wife of a sakada is fulfilling a dream: to become a U.S. citizen so she can vote in the next election. Caring A doctor serves her community through an organization that treats some uninsured immigrants for free. Patriotism Filipino veterans who fought with U.S. soldiers during World War II are hoping their sacrifices are remembered during the centennial as they continue to push for full veteran's benefits from the U.S. government. Thanksgiving When the Manuel family first moved to Hawaii in 1923, they didn't celebrate Thanksgiving. Sometimes there wasn't enough food on the table. But now the holiday is an important family tradition. "Is it going to be an easy shot?" asked Brabazon as his light-brown eyes widened at the sight of the needle. "It will be," Abinsay said softly. Within two seconds, Brabazon's escalating squeals subsided. "Hey ... it doesn't hurt," he said. With his mother and older brother, Brabazon walked out of the Ewa office thanking the doctor. "It hurt when I was a little kid," said Jonathan as he turned to his brother. Abinsay's passion to treat people in Hawaii and abroad has remained steadfast from the moment she entered the medical field in the Philippines. Abinsay attended the University of Santo Tomas in Manila where she initially majored in nursing. But after observing a group of medical students, she changed her mind and wanted to become a doctor. Born and raised in Vigan, Ilocos Sur in the northern Philippines, Abinsay recalled childhood memories of riding in a carabao (water buffalo)-drawn sled with her younger sisters, the manual water pump in their back yard, and traveling on a raft made of bamboo sticks across the river to visit relatives. She arrived to Hawaii from the Philippines in October 1981 after she married Felipe "Jun" Abinsay, now a state representative from Kalihi. THE COUPLE met at Elizabeth's parents' restaurant in Ilocos Sur while she was a college student. "He was a customer," she said. Six years later, they married. Along with the restaurant, her father, Cornelia Lim, of Chinese ancestry, and mother, Anita Arquelada Lim, of Filipino ancestry, also operated a bakery and grocery store. Abinsay said both of her parents stressed to her and three younger sisters and younger brother to go to college. "Life was so hard, they couldn't afford to go to school or further their education," she said. Abinsay said her father, who died 20 years ago, instilled a strong work ethic. "We value discipline. If not, we wouldn't be here today. Otherwise, you'll take things for granted," she said. Abinsay spent a year in residency training in obstetrics at Trinity General Hospital in Manila before she arrived in Hawaii. When she moved to Oahu, she worked as a medical assistant for Dr. Erlinda Cachola, wife of Honolulu City Councilman Romy Cachola, for three years. Then she helped her husband with a print shop business in Kalihi. At that time, Abinsay, who had already passed her state board exam to practice medicine, decided to return to school. Pregnant with her second daughter, Amber, she pursued her master's degree in public health at the University of Hawaii, specializing in maternal and child health. Abinsay was then accepted to a three-year residency program at the University of Medicine and Dentistry of New Jersey. Being separated from her husband and her two daughters was difficult, she said. "It was really hard. Every time you leave the family, you feel so down, and if possible you don't want to be separated. You just have to do it," Abinsay said. She returned to Hawaii in 1994 and a year later started her practice in a medical building next to St. Francis Medical Center West and later opened another office across from Kalihi Kai Elementary School. "I love working with kids. When you work with them, you get to meet a lot of families, nice families," says Dr. Elizabeth Abinsay, shown in her Ewa office. On a recent Monday, 14-year-old Mark Manuel sat on an examining table at her Kalihi office when Abinsay opened the door and started speaking to Manuel's mother, Leilani, in Ilocano to find out more about his acne problem. Speaking to patients and their parents in their native tongue puts them more at ease, she said. "I love working with kids. I like interacting with them. When you work with them, you get to meet a lot of families, nice families," Abinsay said. 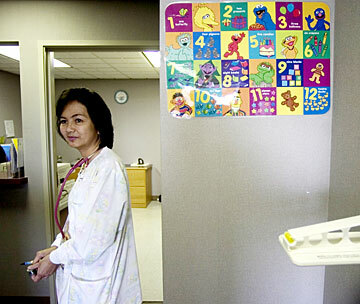 ABINSAY IS ALSO a member of a nonprofit organization, Bayanihan Clinic Without Walls Inc., a group of 50 doctors, dentists and pharmacists on Oahu who provide free medical services to uninsured and jobless immigrants. She also treats patients through the Aloha Medical Mission at the Palama Settlement building in Kalihi. In October 2003, Abinsay traveled to the Philippines with other volunteers from the Aloha Medical Mission to treat hundreds of people in Pangasinan. She is scheduled to participate in another medical mission to Ilocos Sur next month with a group called Sirmata. "To me, you feel that sense of satisfaction. It's helping and making a difference in the lives of people," Abinsay said. Dr. Elizabeth Abinsay gives a flu shot to Jonathan Brabazon as his mother, Kim Brabazon, comforts him. HER DEDICATION has influenced her older daughter to become a doctor. Hazel, 24, is a first-year medical student at the John A. Burns School of Medicine at UH. Abinsay's younger daughter, Amber, 18, is a freshman at UH majoring in biology. During her downtime from school, Hazel helps her mother at the Kalihi office with insurance claims and answering phone calls. Like her mother, Hazel plans to help the Filipino immigrant community. She took Tagalog language classes at the University of Hawaii-Manoa to help prepare herself for the future. "I feel when I get to that point, I'm in a way giving back to my parents. When I see immigrants, I see my parents were once them. I'm saying thank you to my parents and for giving me this life," she said. » Island Television News at 5: Gary Sprinkle takes you to the backwoods of the Philippines' last frontier. 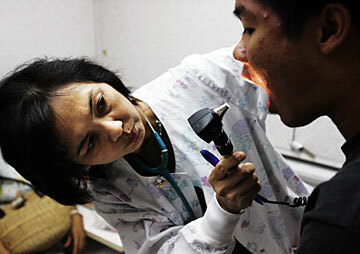 » Island Television News at 10: Filipinos play a huge role in today's nursing community. We'll look back at the pioneers ... the first Fili-pino nurses. They came to Hawaii to help the sakadas, the Filipinos who came to work on the plantations.